Nestled in the depths of WAFI Pyramids, an international haven for culinary experiences from across the globe, you could easily be forgiven for thinking this seventeen-year-old authentic Spanish eatery was located down a side-street in Southern Spain. Its outdoor terrace was closed when we visited, but it’s definitely not one to be missed in the cooler months – and would make the perfect spot for evening sundowners with Seville’s daily happy hour from 4pm till 7pm! 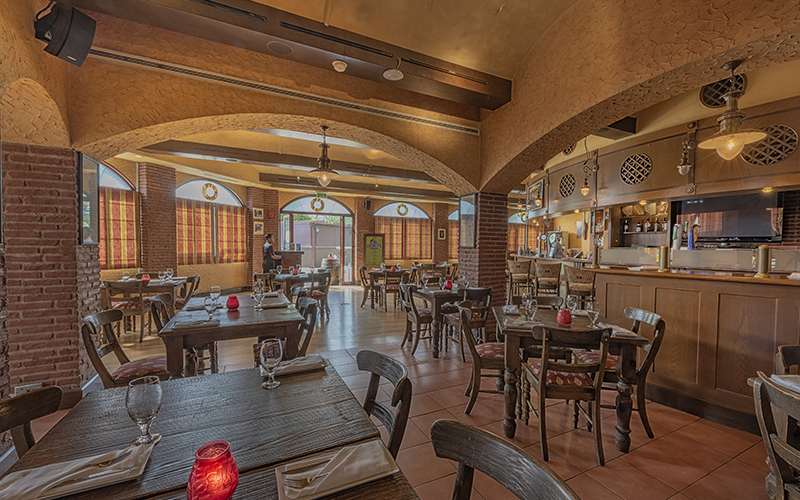 Inside, the restaurant’s exposed brick walls and low-hanging beams, alongside its rustic wooden furniture and lantern-lit interiors create a European-style setting that I so often miss in this part of the world. 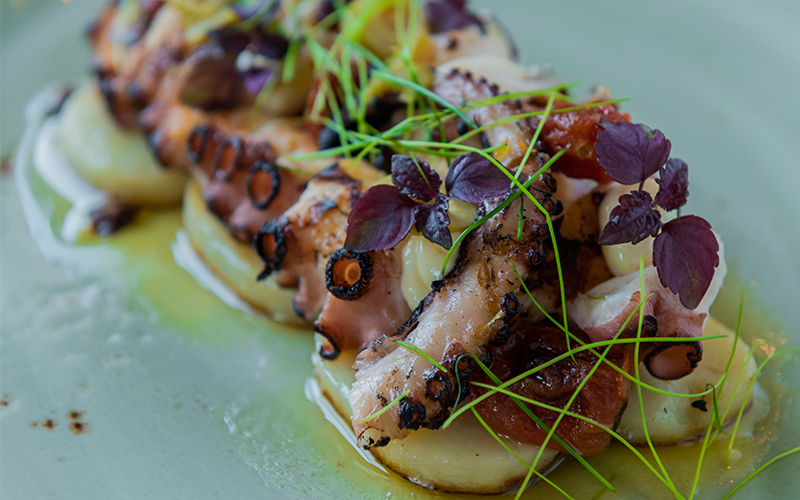 Be warned: the tapas menu – though incredible, is overwhelming to say the least. Dozens of dishes jumped off the page as must-try’s, but thankfully Chef Aleix Font was on hand to offer us his best recommendations. We were served a jug of sangria at the table to start, and began our evening of Spanish indulgence with a selection of cold appetizers. A mix of seabass, scallops and shrimps seviche arrived in crunchy lettuce pockets, doused in a ginger and lime flavour dressing – a must for seafood lovers. Next up, we tried Seville’s patatas bravas, which were not only topped with aioli and a deliciously spicy tomato and paprika sauce, but they also had a surprise centre (I won’t give the game away, but they’re yummy!) We loved the Lubina dish, which featured white fish from the Canary Islands with a pepper, tomato and garlic sauce, topped with toasted garlic and white wine. The honey-glazed beef ribs that followed, soaked in a sauce made up of honey, vinegar and stock reduction and accompanied by mustard mash, were a little taste of Spanish heaven. And though I may not have typically chosen it myself, the fire roasted octopus leg with cherry tomato comfit was delicious. Cooked perfectly, the octopus was tasty and not at all rubbery – restoring my faith in squid dishes! 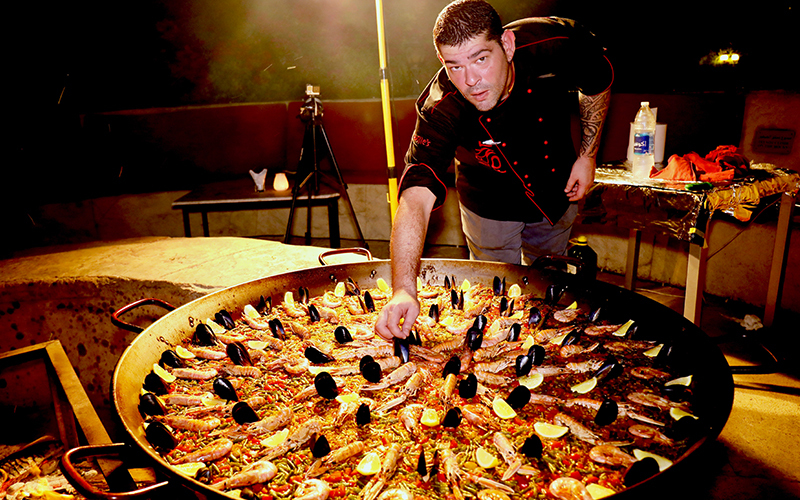 While Seville’s has a wide variety of paellas on offer, it also serves one with a twist. We tried the Fideua; a traditional east coast noodle paella with squid and prawns, cooked in squid ink – so if you’re not a fish fan, this is not the dish for you! I personally prefer traditional paella with rice, but the noodle alternative certainly made for a different experience. How was the service? Seville’s was very quiet when we visited on a Saturday evening, but the staff were very attentive and always on hand to offer insights on each of the dishes. The bottom line: Though on the pricey side, if it’s top quality Spanish food you’re after, then Seville’s is the place to go. Each dish we tried was packed full of flavour and transported our taste buds to the depths of the Mediterranean. Seville’s also offers salsa classes throughout the week for both beginners and advanced level dancers. Want to go? Dishes range between Dhs50 and Dhs100. To make a booking, call 04 324 4777 or email fnb.sales@wafi.com.